"Unique Product with Excellent Support "
UserIQ is a fast-evolving product adding new features regularly. Have a plan for what you want to get out of an analytics solution. Referring to our goals helped during the onboarding tremendously. UserIQ helps us communicate with customers, gather feedback, and promote new features. We identify and message different customer segments within UserIQ based on a number of custom variables and in-app behavior. We've seen significantly higher engagement with product campaigns, such as NPS Surveys and new product launches, because of this. "Powerful product with great customer service"
UserIQ is a versatile and robust product. The customer success team (specifically Elizabeth) is incredible and always follows through. UserIQ is not afraid to bring the development team in quickly to support issues we have with implementation. The product has so many features and ways to track metrics on product usage. The campaigns feature can be really useful for on-boarding. Many interesting/useful graphics to support and summarize the raw data. Product is very useful for both our product and customer success teams (but for different reasons). It can be difficult to install after the fact because code must be written properly to have full feature coverage. It takes more time to set up and maintain than I expected but that's because there is such a deep feature set. Be very contentious and deliberate in initial setup. Best to have the same person set it up as will be your power user. 1. Track customer usage to inform design and product development. Specifically, we want to understand what features are key for customers and which are overlooked or not needed. 2. Understand customer behavior so the customer success team can better identify at-risk customers. Specifically, see which customers have not logged on or used key features recently. 3. Automated, scalable on-boarding. We have a diverse customer set, so UserIQ campaigns are increasingly becoming a key part of our on-boarding process. Thanks so much Ethan! Glad to hear you're finding value in all of our features. Elizabeth is the best! "UserIQ - Product Insight and Customer Interaction Tools"
Being a young startup, we have been so focused on building and iterating our product that we haven't had time or resources to go build a data analytics machine. Because of that, we had limited access to data in regards to user behaviors within our own platform. UserIQ not only gives us access to data, but also has many other tools that we can utilize to engage with our customers -- product tours, tooltips, NPS, surveys, etc. We can segment our customer database, build customer health dashboards, integrate with Salesforce and Slack to provide internal notifications and much more. It's a great tool for both our product team and our customer success team. The software can do so much that it takes a long time to get up and running with enough knowledge to be able to fully utilize the software. Having said that, our CSM was amazing. Super friendly, very helpful and always willing to get on the phone to help walk us through what we were trying to do. They have been very accommodating to helping get us trained and up to speed. As mentioned before, the problem UserIQ is solving for us is having access to additional data and metrics that help us better understand our accounts. This tool is becoming a powerful resource for several of our teams in a variety of ways. We love that UserIQ has been an asset to both product and customer success teams and given you the data analytics you were looking for. Thanks for sharing your successes! "UserIQ's In-App Messaging + Analytics = Creation of Insights to Craft Delightful User Experiences"
In the past, our Product Marketing & Customer Success Teams were dependent upon developers to implement tours to orient new users and introduce new features. The tour content would get stale over time. Yet higher priorities for our small software development team somehow always put off making improvements to the new user orientation. Now using UserIQ, as marketers we can design, implement, measure and continuously tweak the impact of in-app campaigns. This is a much better formula for creating positive user engagement. There are many undocumented buttons and switches in the application that were likely added to solve someone else's problem. You have to ask for help from UserIQ staff to figure out things that should either be more intuitive or at least better documented. That's the bad news. Here's the good news: UserIQ listens to our expressed needs and proactively responds. The toolkit is typically "good-enough" for creating a desired user experience. And, when there isn't a workaround to achieve a particular goal, within reason, the UserIQ product team updates their software to deliver one. At least that's been my experience so far. Our challenge is that in order for an organization to realize value using our application, a TEAM must adopt using it, rather than solo users. In the past, we've relied on expensive sales people to drive team engagement during the trials. Now we plan to leverage UserIQ's in-app campaigns to educate, nudge, and sense sentiment during a 30-day trial to drive aha's leading to team adoption and and higher percentage conversion to paid accounts. "User IQ helps us communicate to our evolving user base." We initially implemented UserIQ for the purpose of making alerts for our users. This is mostly a notice or endorsement upon login but we wanted a system that would allow us to ramp that up to tours and walkthroughs for existing and new features. UserIQ's different notification options allow us to tailor our messages and tours to the best user experience. I think the UI of the actual visuals that the user interacts with (alerts, tours, etc) could use an upgrade. I would benefit from being able to customize further the looks of the alerts that the user sees, not just the color theme. Pass as much user and account information as possible. This makes it easy right off the bat to be able to segment and target your specific user groups. As our user base grew, we realized that we needed different kinds of communication to reach out to our users. Dealing with data, we sometimes experience issues that affect all users on a system wide basis. The initial problem was just lacking a way to communicate through our platform. As we integrated, we started to see places where we could utilize other UserIQ functionalities like tours and feature highlights. Thanks for taking the time to provide us some feedback! Our development team is always working to improve our features. We definitely recommend chatting with your customer support specialist to get the most out of our latest updates and hear when new ones are coming. We're glad to hear UserIQ has helped you tailor messages and create an overall better user experience! "Powerful tool for messaging the right customers at the right time"
Campaigns are simple to build, customizable CSS, and a lot of tools in one platform. Support has been great any time we've run into issues. The CSM team is always willing to setup a call to talk through any implementation and assist with best practices. The search functionality in UserIQ does not function as expected, the results that it pulls back are not specific enough, or exact matches. When creating segments, need more control for handling AND and OR conditions in the same segment. Need an easier way to see if a particular account is in the segment, to preview what messaging they'll see with multiple campaigns live etc. The ability to message users in-app where they're more prime to receive an outreach from us. Email open rates can't touch what we're able to do with UserIQ. Thanks for your review Chris! We're happy to hear you're able to build campaigns with ease and increase open rates with email. We appreciate your feedback on the search functionality and segmentation and will incorporate this feedback into our product moving forward! Quality of the product is high and we have seen continual improvement. Customer service has been exceptional and highly responsive to our needs. Nothing stands out that we dislike. We have had no issues. UserIQ has been very responsive to our needs. They have spent a lot of time with us on the phone to answer questions or to discuss features. They scheduled weekly calls during the implementation to make sure we understood from a technical and business perspective how to make the product add the most value to our business. Any features that we identify they have put in to their backlog or already have on their roadmap. We have complex user actions that we needed insight in to. We also needed to visual customer satisfaction to enable intervention and prevent customer churn. Thanks for your review John, we appreciate your feedback. Happy to hear the great relationship you've built with our customer success team. We look forward to helping you continue your growth! "UserIQ is an enormously effective tool to assist, understand and communicate with your customers"
I love the simplicity of the platform - it is complex, yet easy to use. It is easy to customize variables so that I can collect meaningful information from my customers. I really benefit from the metrics that come built in as it gives me true insight into what my customer are actually doing in my portal. I regularly get requests for functionality and information that UserIQ can provide without any coding...I have been surprised at just how much it can do. The staff at UserIQ are incredibly helpful and are there to help me with any questions I have. The few issues I have had with UserIQ have been fixed within hours. Almost everything I have requested in the way of a feature has ultimately made its way into the product. The only drawback I see with UserIQ is that it can do so much, or accomplish the same task multiple different ways, that I have to contact them from time to time to figure out the most efficient say to do something. There are other companies that have similar products, but UserIQ has proved to be very nimble and able to make changes and improvements at a much faster pace than others. We have a complex b2b portal and the guides are incredibly helpful in guiding my customers through complex processes. Additionally, I am able to track a tremendous number of metrics to know which customers are going to which parts of the portal and why. The biggest benefit I get is being able to segment my users by almost any metric so that I can customize programs and campaigns for more surgical precision. "Great way to see what your customers actually do with your platform"
It is not that I dislike this, but the platform is really robust and takes time and dedication to learn. But what good platform doesn't? Dedicate adequate resources to make sure you are setup for success. If you don't jump in with two feet on the implementation, it could be painful. The product is AMAZING, but you need to dedicate the time to launch it correctly. We had absolutely zero visibility into what our clients were using from a product usage perspective and needed to see what they liked most and what they didn't use. UserIQ has solved that issue for us. Thanks for sharing your feedback! We're happy to hear you've gained better insight into your client behaviors and are able to make informed decisions by using UserIQ. Hang tight as we'll continue to roll out more awesome features! UserIQ provides focused insight into customer behavior and sentiment, while at the same time serving as a platform for building and delivering targeted in-app announcements, tips, and other messages. At times I wish it was easier to sort through the data in the web interface. Most of what I want to know is there, but it can sometimes be tricky to filter everything down to exactly what I need. Because UserIQ is so flexible, it will take some up-front work on your part to set the system up in a way that benefits your company. Having someone with a creative, analytical mind will go a long way. UserIQ is our system for customer health scoring, NPS collection, in-product onboarding, educational marketing, and usage insights - all in one. Since adopting, we've gained confidence in assessing the health of our customers, saved countless hours in reporting, and freed the process of building effective onboarding from the development team. "Flexible onboarding that saves development time"
We get tons of value out of UserIQ but one of the more useful capabilities is to provide timely, personalize onboarding to our users without having to commit development resources. This alone has more than made up for its cost. It can take some time to configure all the events you need for the application your using, but the UserIQ UX makes this process as easy as it possibly could. We need to be able to flexibly adapt our onboarding within our agile development process without having to dedicate developer resources. UserIQ lets us do this. We also need to be able to track feature usage so we can make data-driven design decisions about new features and enhancements. UserIQ enables us to do this as well. So happy to hear you're able to make proactive decisions by using our platform and see great value during the development process. Thanks for the review! "Rocket fuel for helping new customers thrive on your platform"
It's exceptionally easy to create welcoming experiences like guided tours to get new customers familiar with your platform. Like other web application designers we're always struggling with the balance of making a platform that's easy to start with but powerful enough to solve tough problems for our clients. UserIQ helps with both onboarding and ongoing learning to get them to the next level. Not much. Customizing the visual style required making some of the same changes is multiple places, maybe 2 hours of work. Like any implementation, make sure you have somebody in your organization to build it out. It's powerful but not magical. Ensuring a good customer onboarding experience, previously heavy with up-front training led by on-site staff, can be shifted to self-service so our team can focus on adding value and solving tougher problems. It's early for us but we're already able to count on a more efficient onboarding in the near future. "In-App Messaging on the Fly"
I love that UserIQ gives me a simple, easy to way guide users through the key features of our platform through in-app messaging that I can customize the look and feel of. UserIQ cuts down on hours of development time it would take to try and build this ourselves! I can serve targeted messaging directly to select groups - based on usage habits or identifiers pulled right from​ ​​Salesforce. So you have sequences that show specific things on a user's first login, third login, and so on. It makes for successful onboarding, and we also rely on UserIQ to inform users about events, offerings and promotions that are relevant to them. Email inboxes are becoming more and more clogged, so its important that we can rise above the noise by reaching users where they are - in our platform. Not much to dislike. The few times we've had a question they've been quick to respond. Sometimes I get the feeling there's more I could be doing with it, but that's a good problem to have! If you have any need to communicate with users through your website/platform, UserIQ has done the work for you. Don't waste dev time trying to implement your own solution, give these guys a call! As a SaaS platform, its imperative for us to give users the quick, in-app guidance they need to successfully navigate our website. UserIQ provides a convenient solution for this, allowing us to direct customers to the features and functionality they need to be successful and build strong usage habits. The in-app engagements are very easy to setup and use. They've also given us the ability to communicate with our end users in-product, which we've never been able to do before. The metrics the system provides also gives us insight into how are customers are using our product, which features are being utilized the most (and least) and how customers feel about our product. There are some limitations to what data the system can provide and how it is displayed. I will say, however, that UserIQ has been very responsive to our feature requests. We're working towards being more proactive with our customers and doing less 'firefighting' overall. In the past, we've had very limited usage data and have typically had to wait for a customer to come to us with an issue. UserIQ allows us to identify potential issues early on and proactively reach out to our customers- showing them we're engaged and concerned about their success/failure with our products. We're so glad that UserIQ is able to help you communicate and engage more effectively with your users, Megan. Thank you for sharing your feedback! "Helping us with Health Score"
UserIQ is helping us by pulling in usage data and a variety of other factors to influence a health score. The user guides are very helpful and powerful to use, even if a tad complicated to set up. The platform is growing and UserIQ values our feedback highly, ensuring we have a voice to shape UserIQ for our future needs. We would like to factor more than one screen or function for usage. For example, we expect our customers will visit a few different pages in our system regularly and would like to know if they stopped visiting one of the pages, or detect incoming data from another source. We'll be supplying these enhancement requests to keep improving UserIQ. We were able to get our existing guides in place quickly and are working toward the full health score so we know which accounts are at risk. This will allow us to proactively intervene and save these accounts. Thanks so much Tom! Keep the feedback coming, we always want to know how we can improve. You are an integral part of our growth and we're excited to grow with you! "Love the in-App notifications and Tool Tips!" My favorite think about UserIQ is that I don't need to get a developer or graphic designer involved to send out our release notes, webinar notifications, and tool tips. We've setup our Themes and apply them to the notifications and tool tips we need. I can easily add links, graphics, and videos. When designing the notifications, the preview (on the UserIQ design screen) does not accurately reflect the end result. This is not really a big deal as they've made it super easy to preview on our Production environment. We're improving communication with our Users as email blasts were not being read and Users were not aware of new features and fixes. Our weekly complimentary webinar attendance has gone up dramatically since we started using monthly in-App notification. The Tool Tips allow us to provide quick access to specific support documents and videos from the screen where the User has questions. This eliminates the need for them to go to "support" and search for a solution. "Easy to use with minimal dev setup"
UserIQ makes it easy to track and name buttons and site features. It also makes it quick to deploy notifications, announcements, tooltips and more to our user base to optimize their use of our site. UserIQ is a good layer on top of our database to get a deeper understanding of our users, but there are times when it doesn't quite match our own database. I don't use it as a source of truth for metrics, but more as a general understand of how some segments are using our site. Easily launching notifications, modals and tooltips without design resources or dev resources needed. "Great product with some growing pains"
I really like the tool. Once I've gotten good at using it, I can see how powerful it can be and the potential use for my company is definitely there. It is a big of a confusing product to get your mind around. How some of the audience logic works especially has been difficult. I also really do not like the preview mode, as in my case, it is not a true representation of the ultimate audience experience that will take place in our UI. I'd recommend really getting your hands dirty with the onboarding process and do the walkthroughs of the product yourself, rather than watching perhaps another colleague do it. We're using it to help educate first time users about our UI. We still have not released it yet to the public. Thanks for your feedback Daniel! Our Customer Success team is always here to support. Looking forward to seeing how UserIQ supports your overall growth strategy! "We engage with our customers better." UserIQ enable us deliver in-app announcements to our users , guiding them around in-app features while navigating our app. ensuring users are aware of some potentials of the Iroko app. which are usually unknown to new customers. I like the message trigger which we use to trigger messages to select user group ,informing them of new African movies they may be interested in. I like the intuitiveness of UserIQ ,coupled with its effective user support team who are always helpful by being a listening Ear available to assist our product and sales team ,to navigate minor obstacles we experience while making use of this tool. For me , I have come to discover there are lot of features on this application which remain undocumented , and which users of this program will only get to know about ,by cheer coincidence or when they contact a UserIQ support staff for solution to a specific problem. I will suggest the UserIQ team does a re-documentation of all switch and buttons on this app. to update newer features which were introduced probably to solve the needs of specific customers. At the sales and marketing department at Iroko ,we have used UserIQ to discover newer revenue streams for our product , talk to our customers where they are likely to listen to us (in-app) , and adapt our value proposition for effective ROI optimization. Thanks for sharing your successes with UserIQ as it relates to added value, increased revenue and better engagement! Continue to liaise with our support team as they're there to answer all questions and concerns with our features. "UserIQ helps us do it better." Our company operates in quite a cluttered space. It is imperative that we engage our customers quickly and identify when we are at risk for customer churn. We sought out a partner company that would help us do that; we happily found UserIQ. UserIQ is a robust platform that helps us understand more about our users, engage them, and therefore keep them as customers. UserIQ allows us to drill down and identify specific customer profiles (based on usage) and deliver to them the messages, training, and direction that allow for higher engagement and customer satisfaction. We have also recently decided to design within UserIQ a demo campaign that will allow potential customers to access a short, self-guided tour through our product...and then request a full demonstration. This will allow our sales team to spend their time demonstrating our product to a much more qualified, "warmed-up" prospect. I highly recommend the UserIQ product to any company that is concerned about customer engagement and retention. Honestly...I dislike nothing! We depend on UserIQ to drive significant results in our free-trial conversions and our ongoing customer success strategy. Not only does this tool allow you to know your user better, it allows you to engage them at a super-high level. The result? Sales and retention! We are able to deliver effective tutorials and training modules to specific, targeted users (based on their needs). This allows us to onboard our customers more quickly and thus deliver immediate value and loyalty. "Lots of functionality, good tool"
I like that you can help the customers with prompts and tours of the tool and at the same time analyse and make the customer experience better without having to contact them. It can be a bit fidgety to get the tooltips and guides to show up as you want them too, but the customer service is excellent and you will get all the help you need. When it's all set up properly and you get the hang of it, the process is pretty smooth. As our platform changes the customers needs to be in the loop. UserIQ helps us help them to use new features and inform about big releases. And it helps us see if they are using the new features and how. So happy to hear we're helping your business accelerate customer-to-value. Thanks for the review! "A Product That Will Help You & Your Customers Succeed!" I love that UserIQ has listened to their customers over the past couple of years, and built the product to address my pain points as I oversee Customer Success. We are working to get customers the information they need to succeed quickly, through tours, launches, tool tips and more. We're trying to create the best user experience for them and at the end of the day, when they are successful, we are successful. UserIQ helps us make our customers successful. Simple implementation, great features, fantastic support. The team really goes out of its way to make sure we have everything we need. They are quick to respond to support requests, keep us updated on new features of the platform, and more. There is very little to dislike. Their platform is new, so as it matures there have been some minor bumps along the way, but they are always quick to address any issues. We are making a lot of changes to our digital experiences over the next few years and we are leveraging the UserIQ tools to help manage this change for our internal team members and external clients. "I have been very happy with the onboarding, service level, and relationship with UserIQ." You should seriously consider UserIQ for engagement and customer success. This platform is data driven and can be used for any segment that you think is important. This can be leveraged to create a customer experience for your users and allow you to measure their success in a more precise way. We are using UserIQ to onboard customers within our application as well as provide self-help support within our application. We are a young company so the engagement piece is critical to our success. Long-term we will also realize value from health scoring and custom alerts that allow us to monitor and respond to our customers when an issue arises rather than them having to contact us. -The process for creating walkthroughs is a bit clunky but has improved over time. UserIQ has given us tremendous insight into how our users interact with the platform. The ability to segment users by feature adoption has allowed us to create targeted campaigns via multiple channels to educate and support our users. We serve a traditionally non-tech savvy customer base. The ability for us to know how engaged each user is with our platform allows us to be proactive in our user education. "Highly responsive dev team and ever-evolving product"
Highly responsive dev team and customer service. There really isn't anything I highly dislike after the new UI update. It's still too new for me to really pick out any dislikes at the moment. Not the most mature product but they are highly responsive and appear to have an impressive product roadmap. We're adding tooltips and tours for our SaaS dashboards. It also helps us categorize our customers further with their interactions within the app. The team at UserIQ is super responsive to questions and requests and they're quickly evolving their platform to deliver more and more value to me as a client; they listen, they improve, rinse and repeat. Dislike is the wrong word. The UserIQ product is young and evolving, so there are sometimes bugs or hiccups, but that happens with all software and the team is quick to fix things that blink. Crawl, walk, then run. Take time to figure out what you're trying to do and do one step at a time. If feature tours are the main reason, start there, get one campaign worked out, and then slowly scale. Take the UserIQ team up on their onboarding approach. Spend the time in the initial weekly calls, then monthly, it will help you dial in the product to your business needs. Customer onboarding, feature tours, surveys, release notes, product announcements, user feature adoption analysis, customer health, segmented customer communication and data collection. We've gained insight into which features are used most by clients, we've improved user engagement with our product, and improved customer communication and overall satisfaction. Thank you for sharing your experience with UserIQ, Ray! We love your advice for other users to "crawl, walk, then run" as they scale. We're proud to support your team and continually provide value to you and your customers. "Powerful tool for all departments!" Not the easiest to format messages - need to move back and forth from dashboard to website/modal. Would like to be able to easily customize health scores. "UserIQ is an awesome product with a great onboarding team"
We pride ourselves on being intuitive and glad your team is able to use UserIQ with ease. Thanks Eike! "Great Support - Poor UX and IA"
Note: My experience professionally as a Product and User Experience Designer is reflected in this review. I think the Rentlytics customer support rep is very helpful and quick to respond to questions and requests. Bret is knowledgeable but also humble if he does not know the answer to our questions. I wish you had a feature for user flow tracking. I can't talk to every one of my customers so I want to be able to see how they are using my product on a daily basis. That way we could follow a users process as they interact with the website. Feel the naming of items is confusing, at first glance I do not know what I am clicking on. The information architecture makes is very hard to find the data I need. I have to contact CS or a colleague to ask where to find something instead of easily figuring it out for myself. I believe User IQ has the drive to be better, as an org, I am willing to wait until they catch up with some of the other key players. My team at Rentlytics is P&E, our support team uses User IQ as well but for different problems. We are tracking page and element interaction, with this we are studying user feature engagement. We have found that it's very easy to set up the element and page tracking. Thank you for your honest feedback. We agree, UserIQ has a lot of features and it's often overwhelming to get a grasp on learning all aspects of the platform. Feedback like this helps us hone in on what we can add to the platform and where we can provide more assistance as well! We're glad Bret has been helpful in answering any questions; don't hesitate to reach out with additional questions or concerns. "Great tool for monitoring changes in accounts"
We use this tool to keep an eye on our less active accounts. It helps us to be proactive with our clients, and saves us countless hours of manual monitoring. The software is still very early in its journey. The roadmap is full of great ideas that will increase its value exponentially. They are great partners. They listen to your needs, and help find a solution to your specific needs. Keeping track of the "little things" that make a big difference. We have definitely elevated our client relationships by being able to better anticipate our customer's needs. The team was very easy to work with and offered us creative solutions and examples that we could react to. After they understood our needs, they came back with 3 solutions, any of which would work. Our team chose one and they worked quickly to execute. They were also responsive to a couple of last minute needs at a trade show. Good teamwork! Nothing negative to say here. I thought they did a good job. This is a great solution for us and a great team to work with. Our clients are change averse and we wanted to provide a solution that would help our clients understand what was changing and the benefits of what we were doing. We did some great demo's at the trade show and will host the guided tour on our site for the next few months. We expect a fairly easy transition. "Business driving insight at fingertips. Easy to use. Excellent Support. " Infinite possibilities to communicate and engage with users of our software, which in turn help us improve our software, ensuring it delivers true value to our clients. Excellent support. Bret Venuso is very responsive and super accommodating, even at short notice. Not a lot. The reporting dashboard could be a little more intuitive. Last time this was used, data on the dashboard was not consistent with what was on the exported reports (the data on the report was up to date, while the dashboard data was not). This meant the dashboard couldnot be relied upon. "Stellar support and epic product "
Elizabeth has been an absolute delight to work with, she has supported us every step of the way and has gone above and beyond. That I don't have enough time to take advantage of everything UserIQ has to offer. We are using UserIQ to understand client health and help support the onboarding experience. Within day's we know more about our clients than we have known in years. UserIQ's customer support has been amazing. Our team is small, but the time and effort everyone puts in with our company is great. It's taking a bit longer than I wanted to learn how to actually use all of the features, but it's a learning process and I'll get there! We are working on the walk-throughs and launcher and trying to engage our customers more without them just clicking dismiss. The people at UserIQ are great - smart, thoughtful, and genuine. We've been trying to get the project off the ground for a while now - because of our internal strategy not because of UserIQ and they've stayed engaged with us as the project evolves. They are quick to respond to email, willing to help solve problems, and really listen to us. I wish they had more self-service resources available to our organization. They do have a limited knowledge base but it is difficult to find exactly what I am looking for. I'm sure part of it is because the product is always evolving but I'd love if this KB was more robust and updated to stay up-to-date with the newest release changes. We're still flushing out the details of how to deploy UserIQ but we like that it meets users right were they are at. "Pull out all the stops for a key product launch!" Excellent client service and partnership on a pretty tight deadline. The UserIQ team was extremely communicative and very effective in keeping everyone on the timeline. Each milestone was met on time and without drama. As a large enterprise client, a little extra hand-holding when it came to application support was warranted in the end - and might have been anticipated. Every client is different and the team, again, was extremely responsive! We utilize guided tours within our applications and web properties to introduce key features and functionality. The insights gained by the platform are very helpful when assessing next steps for change management and client engagement. "Great tool for In-App messaging and Guided Tours"
UserIQ is an easy-to use tool that requires no coding experience. It's perfect for any size marketing team, whether small or large. We saw great success with many campaigns and increased conversion rates on several key pages of our website. UserIQ continues to improve on its reporting capabilities. They are also improving the experience on mobile. Depending upon the goal, we saw improvements in several key areas. We used the Guided Tour feature when launching a new process for our members, we used In-App Messaging to increase conversions, and we used the Survey tool to gather NPS data in order to help with our product timeline. All were successful uses of the platform. "Great app to help users"
Just put plugin code and it works, no extra coding needed. I actually never came across anything similar at the time we started relationship with User IQ. I believe there're competitors at this point of time. Everybody is quite happy with the solution so we just stick to them. "We couldn't be happier with UserIQ." We like the ability to quickly launch in app campaigns with ease. The UI is a little clunky, but UserIQ is constantly making improvements. We lacked the ability to engage with our customers within our application. With UserIQ we have been able to promote new features, conduct surveys and gather customer sentiment via in app NPS. We all want to know more about our customers and their interactions with our product. UserIQ makes this easier than any other method I have tried. UI could use some tweaks. Over time I am sure it will become more refined. Seeing what your customers are doing with your product is key. We measure the feature utilization, which leads to customer success. "The on boarding went really well and Elizabeth was always attentive and ready to help us learn. " The only thing that needs improvement would be the help center. As a new user, having knowledge articles is key to learning a new system. Great insight into our client usage and although there is a lot of the system I have not been able to setup, I see the value in how much User IQ will help us to be successful. We have loads of great content we'd love to share with you! Elizabeth looks forward to providing articles that will help answer any questions and become more familiar with the product and the user adoption space. Thanks for your review! Super easy way to implement guided tours to point out the most important features. It's quick to implement tours and even customise the look-and-feel. If buttons or links are very close to the edge of a page, it's difficult to get the arrows to point to the right place. Minor detail, but would like this to be more exact. When our clients sign up for a trial of our software, they now see a guided tour as the first thing. This way they know exactly where to start and where to find additional help. It makes it easy for clients to explore on their own. 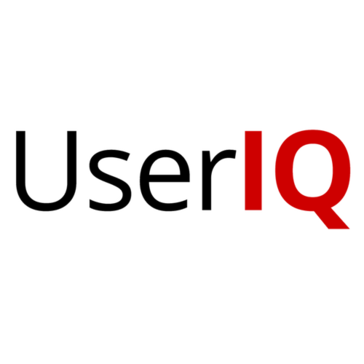 "user IQ has been awesome to use!" like any software, little bugs pop up from time to time. their team has been so helpful if we have had a question or issue! Brett! So patient with me during implementation and so helpful in getting things going. We had a few bugs, still working those out now so we can use the program to its fullest potential. NPS to track customer health, want to use it for training in future. "A flexible platform that offers customizable output for reaching and engaging our clients!" The ease of use allows us to quickly create guided tours and/or announcements that keep our clients current with all of our latest product features. I look forward to additional out of the box reporting or a customizable dashboard for viewing engagement data directly from within the UserIQ portal. In the past it was difficult to ensure each client was comfortable with either upcoming or implemented product enhancements; now with UserIQ, we have been able to directly engage our end-users to ensure they are effectively utilizing our solutions. "Great tool and Customer Service"
UserIQ is excellent for In-App messaging and their team is willing to work with companies to assist with any issues and develop new features. Very excellent and has helped us approve our training attendance and customer communication overall. UserIQ is working to improve their Guided Tours and reporting capabilities. Training attendance and the Free Trial conversions to our marketing software have both increased, we've seen gathered a wealth of NPS data to help improve our customer relations, and it has improved our overall customer communication tremendously. "Amazing customer service and beautiful custom messages." Their customer service, they really cater to my needs and answer all my questions. Kind of good with a downside, they are rapidly upgrading - every time I login there is a change, UI update or new functionality. I am not able to keep up with the changes. Communications to customers. It is a fast way to get a message out to customers, it is very customizable, their customer service is excellent! "Worked well but didn't give us everything we needed"
We mainly used this for our customer success team, I wish the pricing was different so that our analytics team would have been able to take advantage of the platform. Thanks for your feedback, we greatly appreciate the honesty! While we're sad to end services with UserIQ, we're glad you've found a platform that better suits your business needs. Our development team is always improving our product, and this feedback helps us do so! If you are ever interested in reconnecting with UserIQ, our sales representatives can walk you through an updated demo and we'll make sure we cover everything you're looking for. "Setup Can Take Time But Software Is Easy To Use." Allows for targeted engagement with specific users based on CRM data. There are integration hurdles but the UserIQ team has been very accommodating and are continually working to enhance the system and add functionality. CRM integration can be difficult depending upon your software and CRM data. Invest a great deal of time during the evaluation period so that you can be sure the solution is a good fit for your organization. Keeping users updated as to current offerings. Targeting clients with lower usage histories to combat attrition. * We monitor all UserIQ reviews to prevent fraudulent reviews and keep review quality high. We do not post reviews by company employees or direct competitors. Validated reviews require the user to submit a screenshot of the product containing their user ID, in order to verify a user is an actual user of the product. Hi there! Are you looking to implement a solution like UserIQ?